Today we’ll talk about a member of one of the most loaded position groups in Buckeye history, some #MACtion to plan a midweek night around, College Football’s Christmas in July, and a matchup to watch during The Game. Pretty good for a day when the countdown is still in the 70s. In case you missed yesterday’s piece, you can catch up right here. Now please join us as we continue our countdown of the 100 greatest Buckeyes of The Ozone era (1996-present). We will also preview one of the 100 most exciting games on this fall’s college football schedule, and one of the 100 things we’re most looking forward to this fall. Plus, we’ll preview one of this season’s 100 biggest personnel matchups. Ty Howard was one of the more under-appreciated players on this list. He often gets overlooked because he played opposite one of the greatest corners in Ohio State history, Shawn Springs. Howard was never a first-team all-conference player, but was a steady and reliable cover guy on some extremely talented Buckeye defenses. Sharing a defensive backfield with Springs and Antoine Winfield, he was second on that loaded 1996 squad with four interceptions. Listed at just 5-foot-9, he hung with much taller receivers well enough to be a third-round pick in the 1997 NFL Draft. Howard played four seasons as a pro, seeing action in 37 games with the Cardinals, Bengals, and Titans. This rivalry comes during the second week of Weeknight Only #MACtion. There are a bunch of reasons why it doesn’t make sense for the league to play all of its games in the middle of the week during November. It’s hard for alumni to get there, it can get cold, and if you’re having a crappy season, you can have 5,000 people there. But if you’re just sitting at home and looking for something to watch, it’s awesome. The Bobcats should have one of the more entertaining offenses in the country this year. They have virtually everyone back from an offense that topped 40 points in seven different games last fall. And that’s not even mentioning the small chance that Joe Burrow could transfer here. His father is the Bobcats’ defensive coordinator. Ohio and Miami are projected as the top two teams in the MAC East, so this one could also decide the division. A high-scoring game between two rivals with a title on the line? Not bad for a Wednesday. College football’s version of Christmas in July actually comes in mid-June. 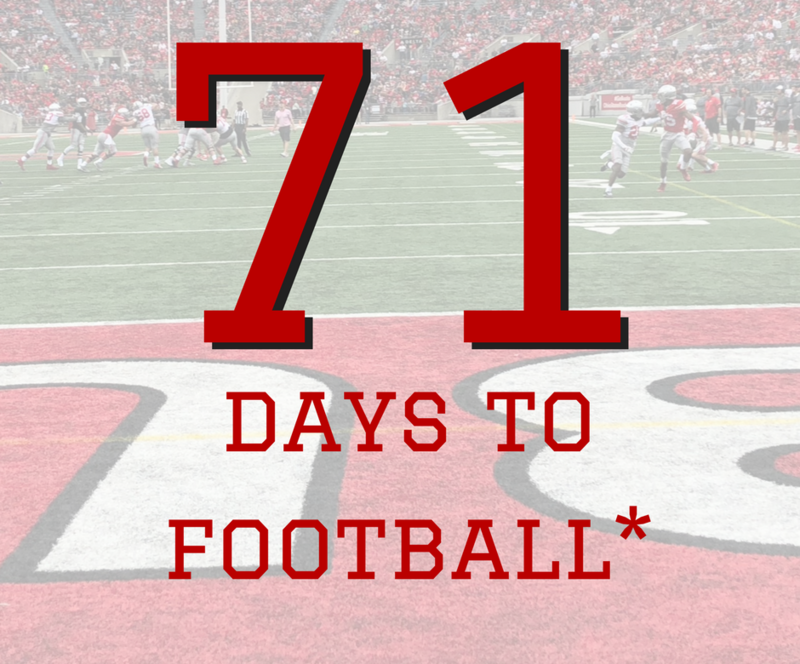 That’s when Phil Steele releases his annual tome of college football stats, facts, and figures. What Steele lacks in humility, he makes up for in volume. Wondering what Louisiana-Monroe’s running back depth chart looks like? It’s in the book. Curious how New Mexico State fared against the spread in 2014? It’s in there. Can’t sleep until you find out how Army has done on natural grass fields since 2010? It’s probably there as well. Preseason magazines are somewhat archaic in the digital age. With a press date weeks or months before the release, some of the information in there is sure to be outdated before you even crack it open. But like the first robin of spring, the first sighting of Steele’s masterpiece is a reassurance that the college football season is, in fact, on the way. So keep an eye out at your neighborhood grocery or bookstore magazine rack in a few weeks. It doesn’t feel like it yet, but Autumn is coming. Michigan’s passing offense was not great in 2017. The combination of young receivers and a parade of not-great and then injured quarterbacks doomed the Wolverines to a fourth-place finish in the East. It’s safe to say Jim Harbaugh is not getting paid $7 million per year to finish between their rivals Michigan State and Rutgers in the standings. The maize and blue faithful think they may have solved their quarterback issue with Ole Miss transfer Shea Patterson. Fixing the receivers means young standouts like Donovan Peoples-Jones, Tarik Black, and Collins must now step up. Collins is a 6-foot-5 matchup problem for defenses. He had only one catch for 12 yards as a freshman, and missed about half of 2018 spring ball with a groin injury. Collins and Black, who is 6-foot-4, give the Wolverines a pair of big targets. If OSU relies on Kendall Sheffield’s speed to stay with Peoples-Jones, the task of dealing with Collins will fall to Damon Arnette. Arnette is listed at an even 6 feet tall, so he’s got decent size for a corner. If he can help deny Collins the ball, that could keep Michigan’s red zone offense sputtering for another season. That would likely earn him yet another pair of gold pants.